If you've ever priced hair decorations for your favorite pooch, you probably were shocked by the high prices. 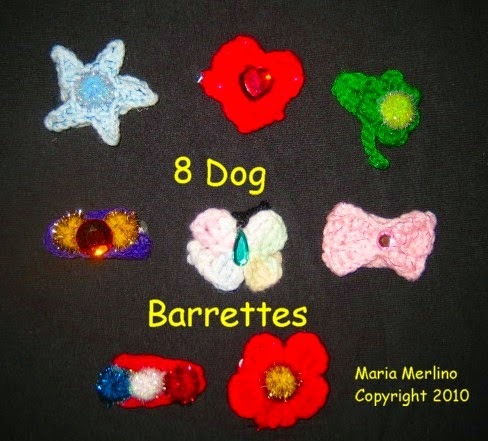 I've designed eight doggy barrettes using hair clips from the drug store, acrylic gem stones, tinsel pom-poms , scrap yarn and simple crochet stitches. Fido will look so chic in his new doo-dads and they will have cost you just a fraction of what the groomer charges. Hot glue and glue gun. 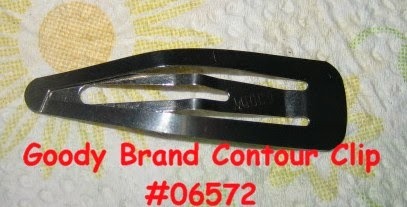 Make sure you only glue the top of the barrette, otherwise you might glue the clip shut. There are close up photos of each barette at the end of the pattern. Yarn color will be determined by pattern. Rnd.2: 2 sc in each st, (10). 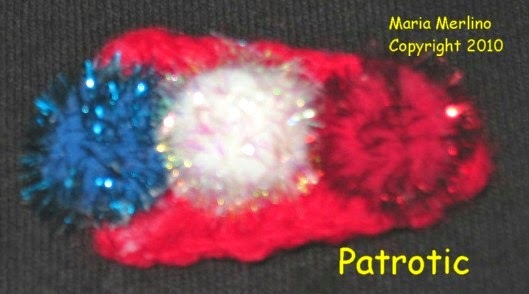 Using light blue yarn, work a covered clip. 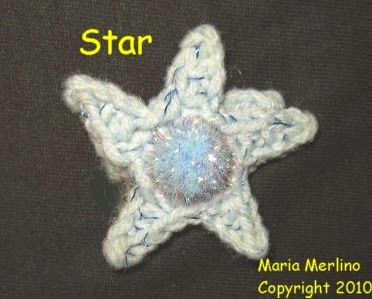 Hot glue light blue tinsel pompom to center of star. Hot glue star to center of clip. Ch 1, 4tr, ch3, sl st ). Fasten off. 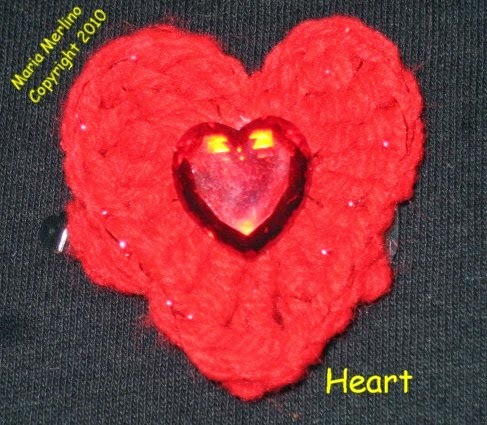 Using red yarn, work a covered clip. sl st in ring) 3 times, ch 6, hdc in 3rd ch from hook, ch2, sl st in same sp, sl st in each rem ch. 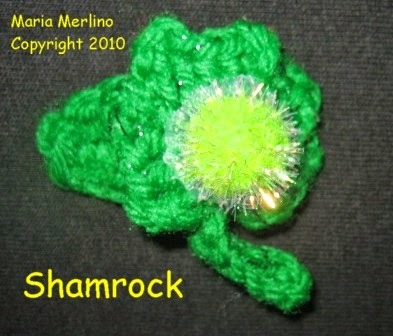 Hot Glue Shamrock to center of covered clip. dc in each rem 2 chs, ch 2 ,turn. sl st in each .of the next 2 s sts, hdc in each of the next 2 hds, dc in each rem 2 dcs, ch 2, turn. Row 3; Repeat for 2. Fasten off. Using pink yarn, work a covered clip. 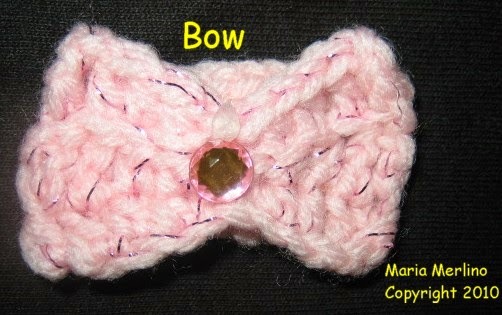 Hot Glue 1/4 " pink gem stone to center of bow. Hot glue bow to clip. 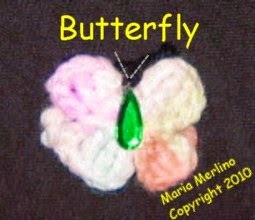 Rnd 1: With pastel variegated, ch 5, join with a sl st to form a ring, [ ch4, 2 tr in ring, ch 4, sl st in rng) 4 times. (4 wings). Fasten off. With a 4" length of black yarn, tie around body with a double knot, keeping the free ends of the yarn at the top to form antenna. Trim antenna. Hot glue aqua tear shaped gem to center of body. 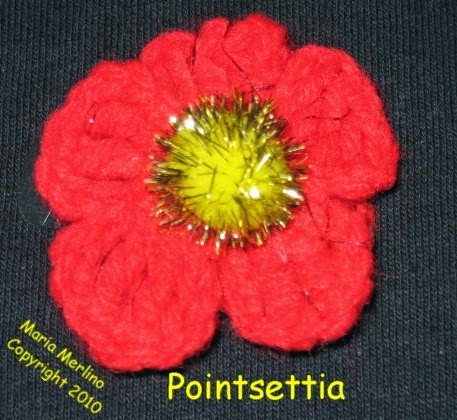 With red yarn, ch 6, join with a sl st to form ring, ( ch 4, 3 tr in ring, ch 4, sl st in ring) 5 times, (5 petals). Fasten off. With red work a covered clip. Hot glue yellow tinsel pompom to center of flower. Hot glue flower to center of covered clip. With purple., work a covered clip. 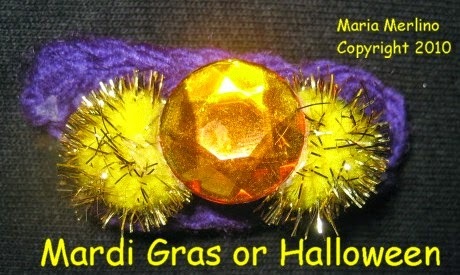 Hot glue 2 yellow tinsel pompoms on center of covered clip with about 1/4"
stone to top of pompoms. clip Hot glue each pompom in place.